December 9 1908 -- Herriman admonishes folks to shop early for their Christmas presents. Not the most exciting message, but a lovely cartoon, anyway. I am awe struck dumbfounded and everything in between to describe how I feel after skimming your blog from the beginning to now. I have not read everything but it has been educational, a history lesson, and a trip down memory lane now only about things in my life but things my mother talked about. I absolutely love the posts on Saturdays. I have two books of the editorial cartoons of Geo Fisher. Fisher was the editorial cartoonist for the Arkansas Gazette for many years. Some of my favorite are one from the 80s concerning Bill Clinton. As Clinton was the youngest governor Fisher depicted him as riding a tricycle. Another editorial cartoonist I have done a little research on is Charles H Alston. Alston was hired in WW II by the Office of War Information to draw editorial cartoons for Black newspapers depicting blacks in positive terms. The cartoons were more propaganda and not all black newspaper ran them. One paper that does not appear to have run them was the Defender. If anyone out there has run across a paper that did run them I would like to know. Thanks so much for your blog. Keep up the good work. carolke5@aol.com. Lately, Friday has been the blog's book series day. However, we're going to put that series on hiatus for awhile. Main reason for that is that I am far, far away from my library, and access to books of interest that have already been digitized has petered out. For the record, I'd like to run Moses Koenigsberg's King News here, and John Wheeler's I've Got News For You. If anyone out there feels like doing a major OCR project, I will of course be thrilled and forever in your debt for sharing. So I was looking around for a new Friday series idea, and found that I had scanned a whole batch of cartoonist postcards. That was a collecting genre that I long ago abandoned after I realized that a lifetime could be spent concentrating on just that small niche. The art is often lovely, though, printed very well in general, and sometimes shows a different side of the cartoonists whose newspaper work we know far better. So I think it worthwhile to share. Thus is born the new Friday series I'm titling, perhaps too cutely, Wish You Were Here from the Cartoonists. In this first installment of the series we have a nice R.F. Outcault card with a witty gag line. Outcault did a ton of cards and they're pretty common, indicating that they were quite popular. Of course Buster Brown was often featured. 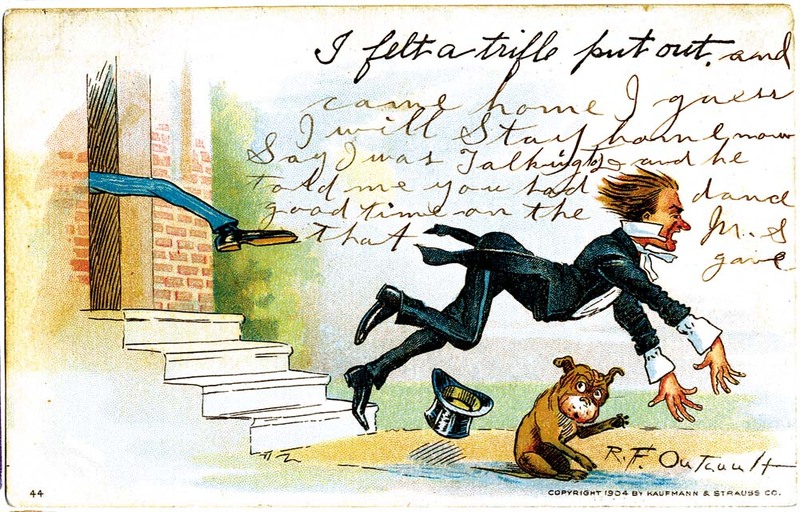 In this 1904 card, which is numbered 44 and copyrighted to Kaufmann & Strauss Co., Tige makes a background appearance, but Buster Brown is nowhere to be seen. This is an undivided back card, and is set up for the message to be written on the front. Our postcard purchaser used the gag line to start his or her message, and though I can't make out all the words, it certainly gives the impression that the gag line provides an excellent title for the writer's state of mind. I don't claim to be any sort of expert on postcards, so if anyone would like to fill us in on the companies, series or other background on these cards, I'm sure we'd all be interested to learn more. Agnes Anne Kelleher was born in Stuart, Iowa, on October 26, 1900, according to the Iowa, Births and Christenings Index at Ancestry.com, and The McCarville/McCarbel Family Genealogy, 900 AD to 2002 AD, Volume 1 (2002). The 1905 Iowa state census recorded the Kelleher family in Wright, Iowa. In the 1910 U.S. Federal Census, Kelleher was the youngest of four children born to John, a farmer, and Mary. They resided in Delaware, Iowa. 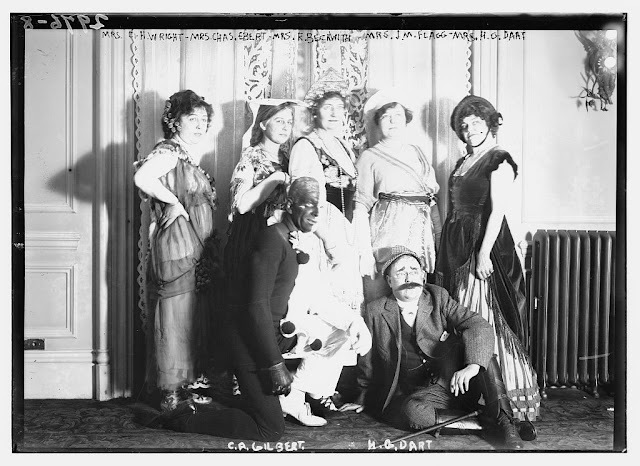 The Kellehers were Des Moines residents in the 1915 Iowa state census. The June 1918 issue of St. Mary’s Chimes, a publication of St. Mary’s College, Notre Dame, Indiana, listed students, including Kelleher, who received music certificates. The Kelleher’s address in the 1920 census was 1116 Ninth Street. A 1921 Des Moines city directory listed Kelleher as a student. In the 1924 Hawkeye yearbook of the University of Iowa, Kelleher was a sophomore and member of the Spanish Club. The 1925 Iowa state census said Kelleher lived with her parents at 665 41st Street in Des Moines. According to the 1926 Des Moines city directory, Kelleher was a feature writer with the Register & Tribune newspaper. She lived with her parents. Two years later Kelleher was a managing editor. Her occupation was the same in the 1930 census. Des Moines city directories, from 1931 to 1936, listed Kelleher as a Register & Tribune employee who served, at different times, as department editor, managing editor and sales manager. Kelleher worked out of the Mayfair Hotel according to the 1938 Dallas city directory. Her occupation was feature broker. Kelleher was joined by her older sister, Margaret, who was a feature editor. Both resided at 4024 Hawthorne Avenue. This was the address for the entire Kelleher family in the 1940 census. Kelleher handled the syndication, beginning April 11, 1939, of Classie Addie, Classified Ad Fan, by writer Ellen Connor and artist Lorene Rutherford. The sisters were listed in industry directories such as the 1945 Ayer Directory, Newspapers, Magazines and Trade Publications, 1948 Editor & Publisher, 1952 Ayer Directory of Publications, and 1964 Annual Directory of Syndicated Services (below). Kelleher passed away February 5, 1999, in Dallas, according to the Texas and Social Security Death Indexes. Lorene Rutherford was born Myrtle Lorene Dellinger in Petty, Texas, on September 12, 1908. Rutherford’s full birth name was found in the Texas death index at Ancestry.com and in Who’s Who of American Women, 1983–1984 which profiled her daughter Jo Ann. The birth information is from the Social Security Applications and Claims Index, also at Ancestry.com. In the 1910 U.S. Federal Census, Rutherford was the only child of Charles Sidney, a bookkeeper, and Pearl. Also in the household was Rutherford’s maternal grandmother, Julia Bruffett. They resided in Roxton, Texas. Rutherford was the oldest of four sisters in the 1920 census. The family of six lived in Justice, Texas. The Paris News (Texas), May 10, 1942, said Rutherford’s art training began “in the public school classes at Oak Cliff High School in Dallas, taught by Mrs. Nellie Clement.” Rutherford said she inherited her talent from her father. The Paris News, March 2, 1999 said Rutherford married Newton Franklin Rutherford in Roxton, Texas, on October 17, 1926. The 1930 census recorded the couple in Petty, Texas on Main Street. After the birth of her second daughter, Rutherford started weekly commercial art instruction from A. J. Swindell in Greenville. Rutherford continued her training at the Art Institute in Dallas, where she studied life drawing under Olin Travis and fashion sketching with Mrs. Harriet Grandstaff. 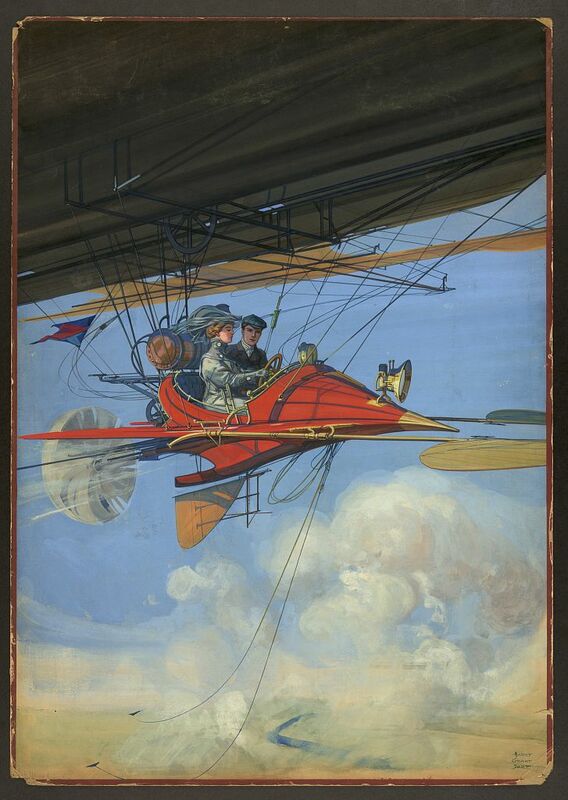 Rutherford’s early commercial work involved drawings for advertising and department stores. Later, she met Ellen Connor, a writer, and they produced Classie Addie, Classified Ad Fan, which ran from December 11, 1938 to May 16, 1940. The panel was syndicated first by Publishers Press Features followed by Agnes A. Kelleher. Rutherford and Connor also produced the strip, Snaggle Tooth and Little Ruth, in 1940. Freelance artist Rutherford continued to be a Petty resident according to the 1940 census. She, her husband and two daughters, Mary and Jo Ann, lived on Main Street. During the second World War Rutherford worked at Perkins Brothers store and Camp Maxey. The 1957 Paris, Texas city directory listing said Rutherford was the assistant credit manager at Ayres Dry Goods. Rutherford passed away February 28, 1999, at the Heritage Care Center in Paris, Texas, according to the Paris News. She was laid to rest at the Forest Hill Cemetery. A couple of gal-friends in Paris Texas, one a passable cartoonist, the other afflicted with the jingle-writing bug, decided to combine their talents and offer a feature to their local paper. To sweeten the offer, they made their feature a daily paean to the wonders of the newspaper classified ad. Newspaper editors of the day seemed to just love those features, and the editor of the Paris News was apparently no exception. Thus was born Classie Addie, Classified Ad Fan, a daily cartoon and poem in which classified ads are the one thing that can heal you of all the multiplicity of ills in this life. The panel cartoon by artist Lorene Rutherford and writer Ellen Connor debuted on the front page of Paris News on December 11 1938. Evidently Paris News thought a lot of it, because they seem to have created a syndicate, Publishers Press Features, to hawk it to other papers. However, they then found Agnes A. Kelleher*, a syndicate out of Dallas, and contracted out the actual distribution of the feature to them starting April 11 1939. The feature seems to have ended up appearing in at most 8-12 Texas newspapers. Evidently the ladies had bigger dreams than a small client list like that, because they gave up on the daily grind of extolling the virtues of classified ads in pretty short order. The last daily appeared in the Paris News on May 16 1940. As an aside, this was not the pair's only feature -- they also did a weekly comic strip for the same paper, titled Snaggle Tooth and Little Ruth. That feature only lasted six months. * the Agnes A. Kelleher syndicate is quite mysterious to me. It was based out of Texas, and my guess is that it was associated with one of the big Dallas newspapers. But who Agnes was, and how she came to be running a newspaper syndicate out of Dallas I have no idea. Found a few links, but little info. Apparently the A. was for anne and she owned the syndicate with her sister Margaret. If you have a subscription to newspapers.com, you can probably find out more than I can. Harry Grant Dart was born in Williamsport, Pennsylvania, on November 3, 1868, according to two passport applications found at Ancestry.com. The 1870 U.S. Federal Census recorded Dart as the youngest of three children born to George, a life insurance agent, and Anna. The family resided in Williamsport. Information regarding Dart’s education and art training has not been found. The 1887 Williamsport city directory listed Dart as an artist at 412 Elmira. In 1888 resided at 203 Market and the following year he was at 341 Pine. In 1890 Dart made his home in Somerville, Massachusetts, at “291 Elm W S”. The World Encyclopedia of Cartoons (1999) said Dart worked briefly for the Boston Herald. New York City was Dart’s home according to the 1891 city directory. The illustrator’s address was 369 West End Avenue in Manhattan. On September 10, 1894, Dart married Luella J. Sheets. The couple had a five-year-old daughter in the 1900 census. They resided in Manhattan at 256 West 85th Street. In the 1905 New York state census, the Dart family continued to live in Manhattan but at a different address, 2790 Broadway. American Newspaper Comics (2012) said Dart produced comics for the New York World and New York Herald. The Explorigator appeared in the World from May 3 to August 9, 1908. The Herald published Boys Will Be Boys from February 7 to May 9, 1909. Dart wrote Cynthianna Blythe which was drawn by Wallace Morgan. Their collaboration ran from 1909 to 1910 in the Herald. The Sprightly Adventures of Mr. Homesweet Home debuted July 7, 1909 in the World. 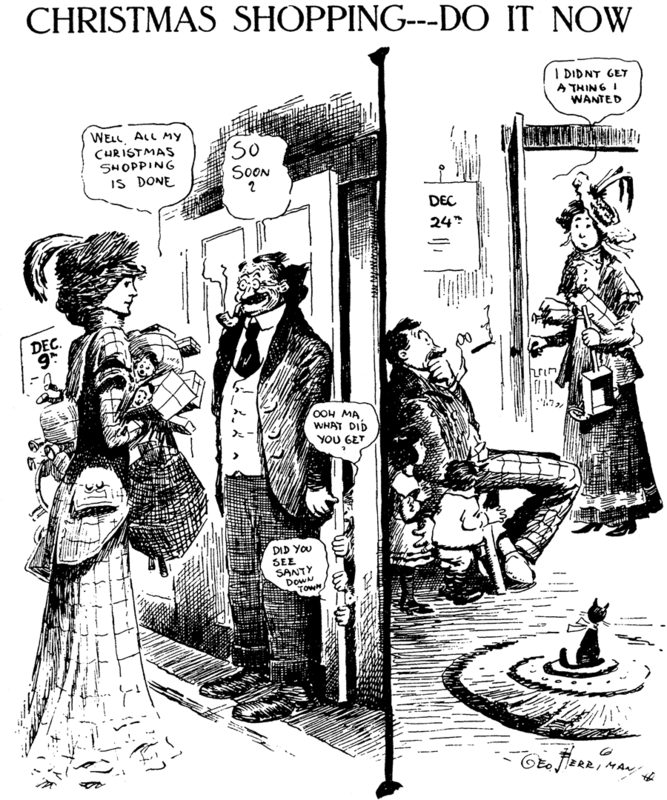 The strip ended May 25, 1912. Homesweet was published as book in 1914. Some of Dart’s full-color illustrations for magazines are here. A selection of Dart’s flying machines are here. At some point Dart moved to Amenia, New York. Dart and his family were recorded there in the 1910 census. Dart was mentioned often in the local newspaper, Amenia Times. Harry Grant Dart, formerly cartoonist for The Denver Times, has scored one of the hits of the day in the realm if magazine illustration with his stirring imaginative picture, “The Accident to the Transcontinental Flyer” in Harper’s Weekly. Mr. and Mrs. Harry Grant Dart entertained Artist Morgan of the New York Herald and a gentleman friend for the week-end and over Sunday last. Mr. and Mrs. Harry Grant Dart and her daughter, Miss Dorothy, were interested spectators of the serial evolutions at the great aviation meet at Belmont Park, New York, this week. “Blundering Billy,” a farcical comedy in three acts, now actively being rehearsed by well know local talent under the efficient direction of Harry Grant Dart, will soon be presented to the Amenia public for the benefit of the Amenia Fire Company. See bills for date and further information next week. Rehearsals are in active progress for the production of “Blessington Springs” Mr. Harry Grant Dart’s drama under the supervision of the talented author which will be produced at the opera house on the evening of February 22nd. Mr. and Mrs. Paul West were week-end and over Sunday last guest of Artist Harry Grant Dart. Mr. West is the editor of the Metropolitan Section of the New York World. They are looking for a country home for the summer, preferably a small farm, which they would like to acquire. Artist Harry Grant Dart entertained Artist (Fluffy Ruffles) Morgan of the New York Herald staff over the Fourth and they and the other "kids" had lots of sport at the Pratt House with firecrackers and other detonating material. Mr. and Mrs. Harry Grant Dart spent the forepart of the week at the metropolis. Mr. and Mrs. Harry Grant Dart went down to the great Metropolis on Saturday last, and trans-shipped immediately to Larchmont, where they spent the week-end as the guests of honor of the Hit-em-Hard Club, a well-known and exclusive organization of that very exclusive suburb. Mrs. Harry Grant Dart and daughter, Miss Dorothy, have returned home from New York City. Miss Dorothy Dart, who has been spending the Easter vacation with her parents, Mr. and Mrs. Harry Grant Dart, returned to her studies at Brearley School in New York City Monday. Mr. Dart accompanied her and returned a few days later. Mrs. W. L. Jacobs, of New York City, is visiting Mr. and Mrs. Harry Grant Dart. Mr. Jacobs, accompanied by Wallace Morgan and Harry Wood, are expected today. Dart was a regular contributor to Life which profiled him in its August 17, 1911 issue. The New York Tribune, February 22, 1914, published a drawing by Dart of himself. Dart returned to New York City and changed residences frequently. In 1914 he was at 15 West 67th Street. The following year Dart made his home at 26 West 8th Street, according to the 1915 state census. The 1917 and 1918 directories listed Dart, an artist with the World, at 345 Edgecomb Avenue. The Chelsea Hotel was Dart’s home in the 1922 and 1925 directory listings. Passenger lists from 1928 and 1930 had Dart’s address as the Hotel White on Lexington Avenue at 37th Street. A profile of Pop Momand, in the Evening Star (Washington, DC), September 28, 1921, said Momand got his start from Dart. Dart passed away November 15, 1938, in Laconia, New Hampshire. According to the New Hampshire death records at Ancestry.com, the cause of death was cancer.